A student using Montessori concrete materials to learn math. Children love beautiful language, and we give them exact terms like these to name their environment and convey their thoughts. the movable alphabet (the formation of words by combining phonetic sounds). 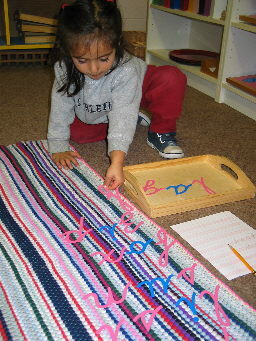 Further, the children work with materials to concretely learn the function of words. Finally, Montessori students experiment with reading analysis. Copyright © Guelph Montessori School, 2019.